Not long ago, I downloaded Parallels version 8. Besides the usual minor tweaks any upgrade will bring, I was delightfully surprised to find my Apple® Keyboard added to my virtual machine’s selection. As a translator, you may need to access special characters in your language and, when you have to work in a Windows application like memoQ, for example, even the extended US International keyboard doesn’t always cut it. With the Cmd, Option, and Shift keys on the Apple Keyboard, you can reach a very wide range of characters, and lo and behold, you can now access them with the very same shortcuts in your virtual machine! If you are still running Parallels 7, it may be time to upgrade. When it comes to displays, change is on the way. At the time of this article, the next upgrade of OS X®, 10.9.3, seems to integrate Retina® resolution for third party 4K displays attached to Retina-capable Macs® (just the MacBook Pros®, for now). This is a big deal for people working in front of a screen all day long. It will surely take a while for PC applications to display in full Retina resolution, but for those of us who translate in the browser, that should make life much sweeter. You may be increasingly reading your email on your iPhone® or iPad®, or you may have forfeited Apple Mail altogether. 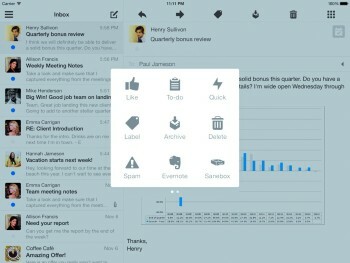 On iOS, you will find a series of apps that are worth a try: MailPilot (nifty and pricey), Mailbox (smart and solid), and Boxer (powerful) are bringing innovation to the tried and true art of managing your inbox. Translorial is an independent publication and has not been authorized, sponsored, or otherwise approved by Apple Inc. Apple, iPad, iPhone, Mac, MacBook Pro, OS X, and Retina are trademarks of Apple Inc.
kim posted this article under Announcements, Business Tools	on Thursday, May 1st, 2014 at 12:02 pm	You can follow any responses to this entry through the RSS 2.0 feed. Both comments and pings are currently closed. Prev Article ← NATURAL ENGLISH IN JA-EN TRANSLATIONS? YES, IT IS POSSIBLE!